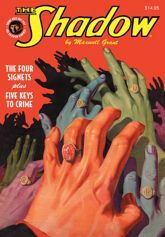 First, The Shadow knows that "The Four Signets" hold a secret message that spreads crime and murder in their deadly wake. Then, the bequest of a rosewood music box leads to "Five Keys of Crime" that can provide its young heir with a fabulous inheritance�if he lives long enough to collect it! BONUS: A Hollywood star steals the picture when female sleuth Carrie Cashin investigates the mystery of "The Three X's" in a tale by Theodore Tinsley. This instant collector's item showcases the original color pulp covers by George Rozen and Modest Stein, the classic interior illustrations by Tom Lovell and Paul Orban, and commentary by pulp historian Will Murray.